I wanted to pass along some mast rigging thoughts based on my recent rigging of a new Selden Alto section. I would like to express thanks to Tom Sharkey of Selden USA for his support of the 5O5 class and for assisting me with my rig. For a long time, North American sailors had to import rigs at a very high cost. It was not unusual to pay $1100 or more for a partially rigged M2 (t-ball terminals, spreaders, gooseneck, sleeves was about all). Now we have an East Coast distributor down in Charleston, South Carolina run by Tom and catering heavily to dinghies. Having the local distributor has brought prices down and Tom and his crew have been coming up to speed on 505 rigging peculiarities and preferences (we are a picky bunch). I met Tom last summer while he was rigging a mast at SSA for Tom Sitzmann. I took the opportunity to educate them on how we tend to do things and why the details are important. While I have an unrigged M2 sitting in my garage, with Selden USA now offering a great product and “local” support that it was a good time for me to jump back to Selden. Of course, it also helps that Selden now offers a direct competitor to the Supersars M2 with their Alto section. The Alto stiffness specs are very similar, with slightly stiffer side bend characteristics and slightly more flexible fore/aft characteristics. In my view, the numbers are so close that’s it’s not worth the discussion although someone may wish to bend test the rigs for comparison. Here’s the published data for the most common masts. According to the data, the Alto 505 section should only be about 0.2 kg heavier than the M2. I think it’s hard to draw an apples to apples comparison between tubes unless they are truly bare (no fittings, no sleeves, exactly the same length, etc). Rather, I plan on measuring my all-up weight of both rigged masts because that is what ultimately matters on whether I need to consider removing weight from the hull. Anecdotally, I have heard that the Alto 505 section is more like 1 kg heavier than the M2. Having rigged many masts from basically a bare tube (including the installation of sleeves), the time spent doing this can be rather extraordinary. I decided that it would be worth it to have Selden rig most of the mast for me. Tom spent some time measuring specs on my current M2. Shroud, forestay, trapeze, halyard sheaves, and trap twing fitment would all be the same. I chose to modify slightly my ram track and spreader placement (25mm higher on the ram track for more pre-bend potential and 50mm lower on spreaders to even out the fore/aft bend profile by placing the spreaders more central between the hounds and deck for more even bend characteristics). Ethan Bixby and Augie Diaz have been experimenting with lower spreader heights. I specified 3048 mm from the datum (10 ft) which is not a radical change. Tom’s crew expertly installed all the hardware with holes milled perfectly and stainless fittings, fasteners, and rivets insulated from the aluminum with Duralac. Placement was perfect. The ram was backed with tapped G10 as per my direction. The mast base was squarely cut to size to accept one of Selden’s 6 sheave bases (I am one of the few 505 owners in the US that seems to favor these for ease of running rigging exits and fewer exit holes). 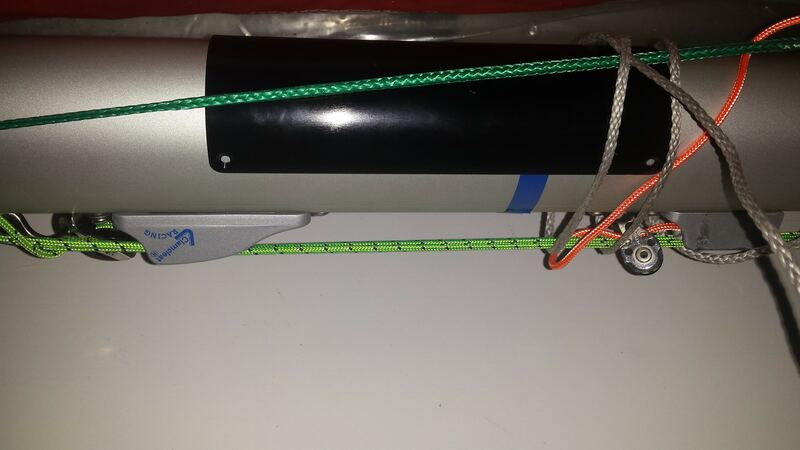 When the mast arrived it was wrapped and padded carefully for delivery with all uninstalled supporting hardware in a box (pole launcher swivel cleats, spreaders, and a few other odds and ends). Leader lines were supplied for ALL running rigging which is a big time saver! Bands were also installed at the proper locations. This struck me as a very professional product. What makes the Selden product exceptional is the quality of their extrusions and the hardware. There is an obvious difference between the SuperSpars M2 and the Selden Alto in terms of fit and finish and attention to details. Selden claims to have exacting manufacturing tolerances. The anodizing is quite nice on the Alto, having a very hard satin finish, heat treated and ball peened for durability. The Selden die also creates a very nice front centerline seem to help locate hardware precisely (see the seam below the weld). Selden Alto on top and SuperSpars M2 on bottom. Selden caries their taper on the Alto (and Cumulus) approximately 220 mm lower than the M2. This would theoretically create more upper mast bend and perhaps better dynamic gust response. The apparent better quality of the Alto weld bead is actually more due to the fact that the original weld bead on the M2 had a quality control issue and was subsequently re-welded manually by a local. 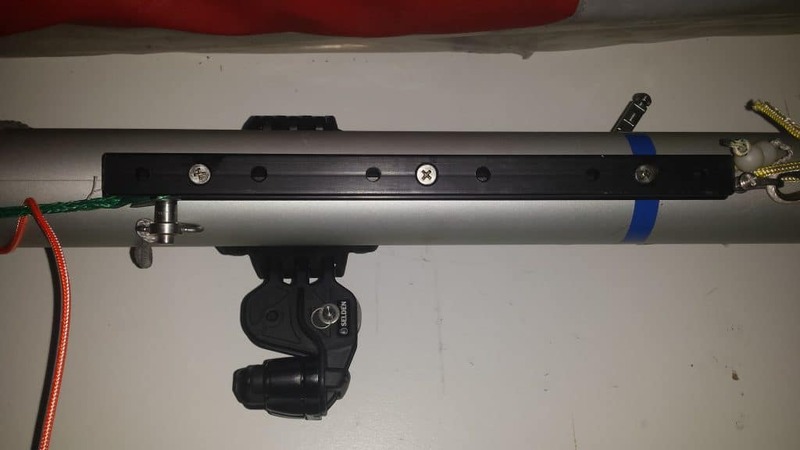 This had no impact on the performance or durability of the M2 and that mast was used exclusively on my boat since 2009. The performance record of the M2 in the 505 class over the last 10-15 years is undeniable. Selden has advanced manufacturing techniques with CNC controlled Plasma cutting and automated welding of the taper that gives the taper consistent characteristics along the seam and from section to section. I could not find any specific manufacturing information on the SuperSpars website other than claims of greater magnesium content in their alloy that promote better dynamic response. 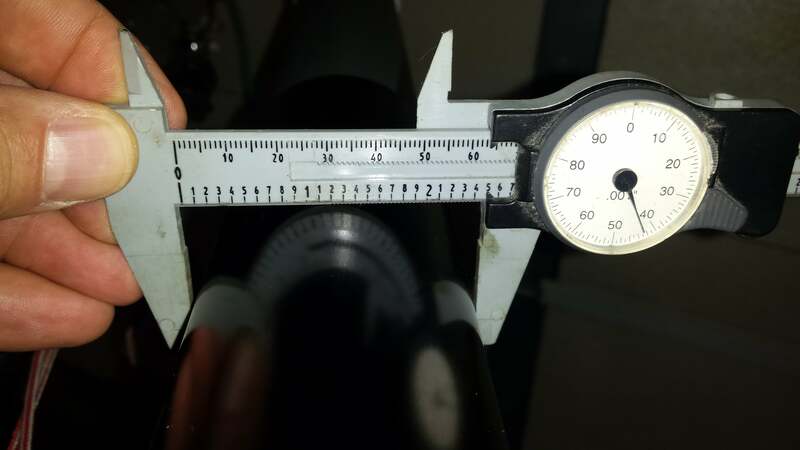 Ironically, part of the allure of some less precise mast manufacturing is that you can find a “faster” mast by sorting through the stock and weighing and bend testing extrusions. What happens is that as a die wears, the extruded sections it produces get thicker and heavier. This used to be the way Laser sailors would do it – go to the factory and find the best top and bottom sections. I have not done rigorous testing of sections in 15 years, but back then there were differences among published stiffness numbers and tested bend characteristics. Production methods have since improved such that differences between sections are minimal. This is a 505 mast so the devil is always in the details, and Selden did a pretty good job translating my requirements onto the mast and greatly reducing the time required for me to finish it off. Installation of the T-Ball terminals is exceptional and better than any amateur rigger can do. The new T-Ball plugs that Selden offers are also a very nice detail with contoured surfaces and a harder rubber making installation much easier than the old rubber ones. Again, the devil is in the details. The trapeze line T-toggle I use are a great combination of strength and weight. You will not break these forged pieces. 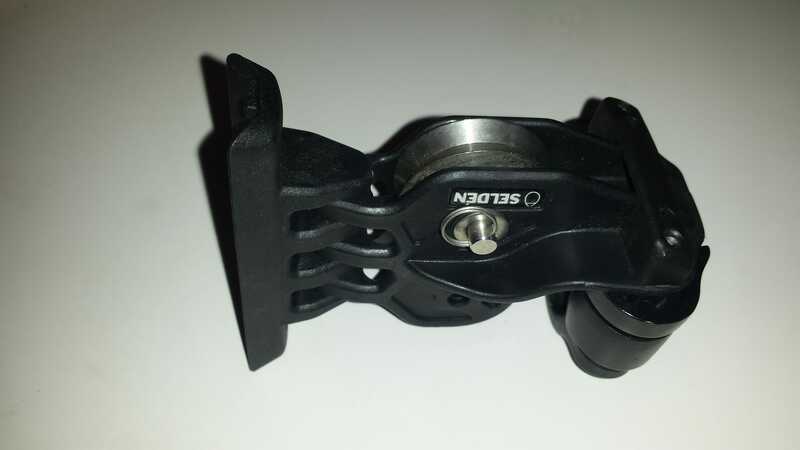 Selden also manufactures a welded toggle that looks nice. APS sells a version too but it too is welded now. I use Ronstan 20mm Thru Deck Blocks for my trapeze twings. I’ve been using them for 10 years on 4 different rigs. There is absolutely no issues with the hole here causing rig failure since the moment from the shroud terminal to the cutout is small. The reduced friction is great. Another detail that Selden offers is in the fasteners they use, which are self-tapping stainless Torx head fasteners making installation and removal easy. No need for rivets! You will need the appropriate Torx driver in your kit though. Another detail I prefer is the bent eyestrap and small stainless ring (instead of a block) on the bottom fastener of my jib halyard sheave for the topping lift (see on the right in the picture above). This reduces the need for another sheave. 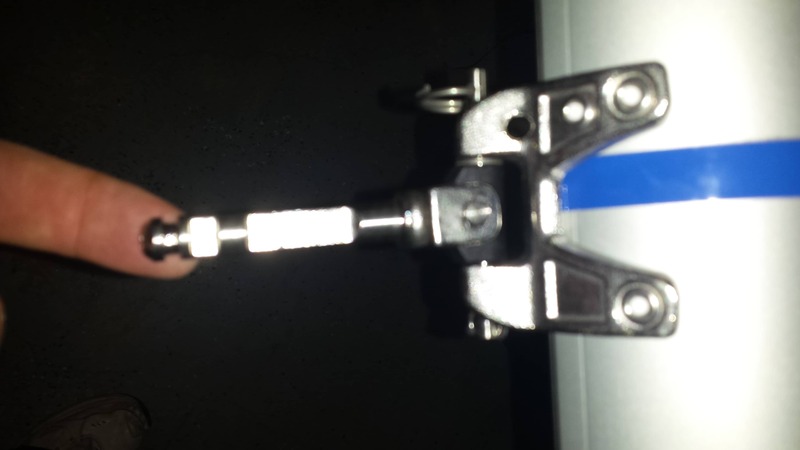 I use a 2-3mm spectra topping lift run through a small exit hole below the ring. Another comparison of fittings. The Selden fitting is definitely of better quality and of heavier gage, and the spreader system offers fine adjustability by hand. Having said that, I have never had any issues with the SuperSpars bracket, although adjustment with set screws can be a pain and the very small screws seem like they would break. With lower spreaders, I opted for the slightly longer 400 mm spreader that Selden offers. 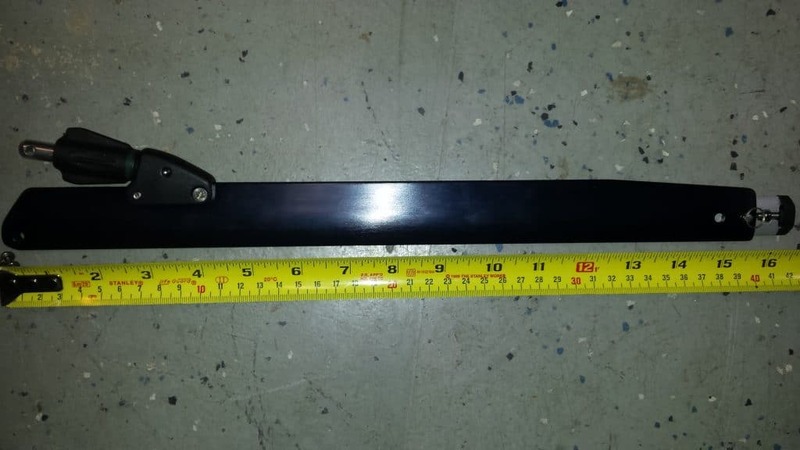 This reduces the extension needed at the end to meet sailmaker specification for spreader length (I use 16.75”). This is a nice part, upgraded from their previous all composite version. The bracket is alloy and has an additional extra small rivet to help keep the fitting from getting torqued. They include a stainless quick pin to make removal easy, although part of me wonders if the rather small pin can take the compression loads. I had upgraded all of my previous pins with a larger stainless bolt. The toggle is still composite. I have never broken one but others have. A machined stainless toggle would be preferable. The pin is also stainless now and a very nice piece that integrates well with Selden alloy boom end fittings or most carbon 10mm pin holes. This pin fits perfectly in my Waterat boom. 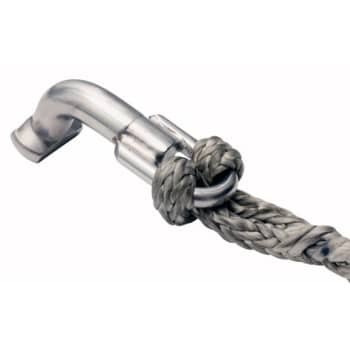 For those that prefer to use a mast-mounted swivel base for the pole launcher, Selden offers a nice composite part with an upgraded aluminum cleat and bigger stainless ball bearing sheave. I insisted on these parts because the sheaves can be under very high load and composite cleat teeth can wear out quickly. 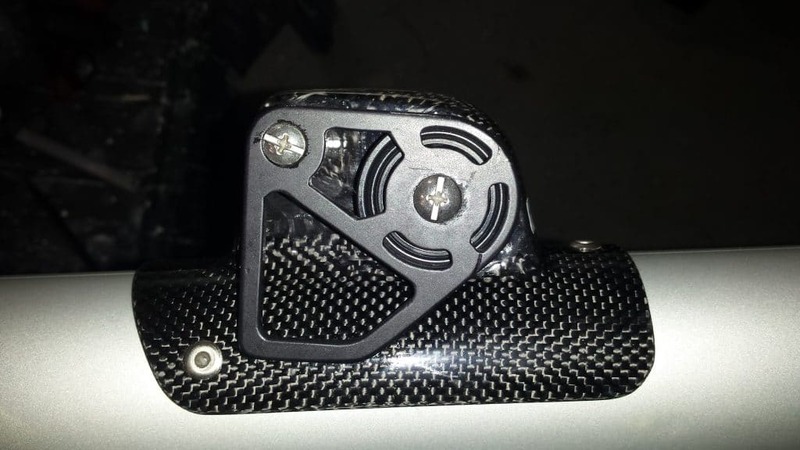 My M2 uses a Ronstan swivel base with Harken sheaves and cleats. I may have even doubled up on the internal springs in the cleats for more positive and reliable cleating. 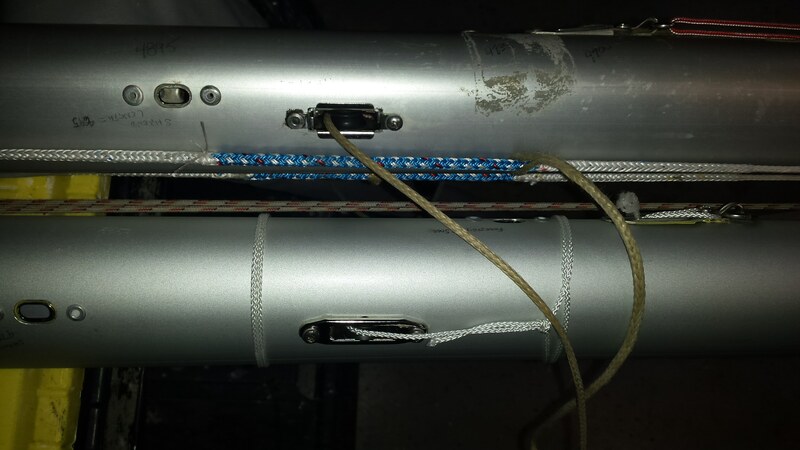 I mounted these swivels to either side of the mast below the boom using tapped ¼” G10 backing. I also use a thread locker. In retrospect, I may switch to custom aluminum brackets with rivets for a more durable and reliable solution. An alternative to the expensive South African “Spinno” is the Waterat Spinno, made of carbon but with alloy sheaves and side plates. The new side plates have been extended all the way back to the bracket to keep the line from jumping the sheave. Larry will sell you an upgrade kit for $60 if you need one. Some people have retrofitted their older fitting with mylar shimmed between the plate and the block to provide the same effect. Selden installed my mast ram as instructed, 25mm higher than before to give me a bit more flexibility on adding additional pre-bend for light air. The position of your track might vary depending on the geometry of your ram strut (length and position on deck). One minor omission – the fasteners securing the ram come with plastic isolation sleeves that weren’t used on the install (they come with the Ronstan track). I have some spares that I will put in to keep galvanic issues from occurring. Selden did add new black anodizing on the top and bottom cuts of the track which was a nice touch. The pull pin at the right is simply used when rigging and unrigging to keep the ram from sliding down while the forestay is off. I may need to use it for pre-bend should I not rig a pre-bend control line. I haven’t used one on 9003. I chose to place my main halyard cleat for my 2:1 halyard below the deck and on centerline this time around. The above deck location was generally fine but occasionally a jib sheet would snag on it. I also chose to return to the mast-mounted topping lift for ease of rigging and the fact that we hardly ever adjust during a race unless it’s to lower it which usually means the wind is light and the crew is hating life inside the boat. 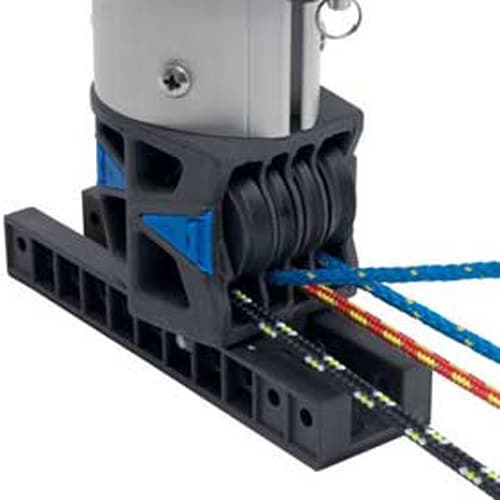 The centerline mounting allows for securing of the cleats and blocks without drilling holes. I typically use a tapped 3/8” aluminum round stock cut to size and slid into the sail track. You can get the stock at the hardware store and tap yourself. This makes for a clean install. 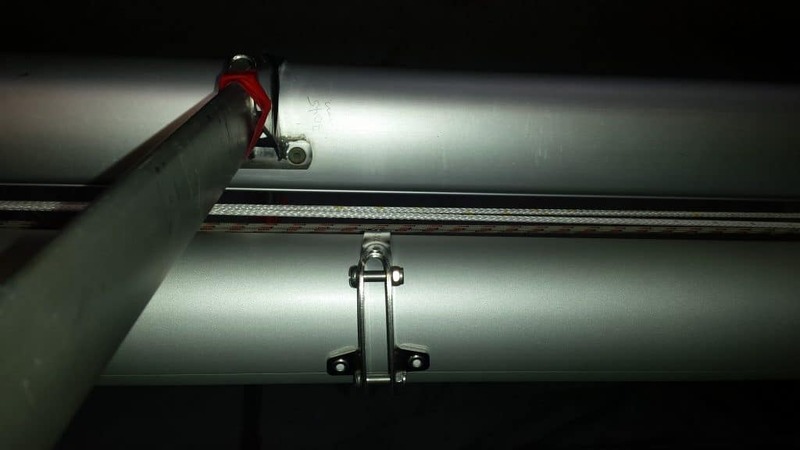 You can also use a sail track stop which is nothing more than a tapped stainless slider that goes in the sail track and accepts a machine screw. A locking nut and washer will also work. I had not yet secured the collar with rivets but they were supplied by Selden. Note deck datum band installed. A few notes on the mast base bear mentioning. I use two vang bails – the upper for the higher load part of the purchase and the lower (obscured) for the control line purchase. You can definitely get away with one large bail but I like to keep them separated because I use a split double-ended control line run to each side of the cap. Keeping the lines separated reduces some friction on my system at the expense of some additional rigging hassle. I use a snap shackle for the high load and a large sister clip for the low load. No issues ever with either. My main halyard is temporarily secured to the upper bail. The 6-Sheeve base is also shown on the far left. 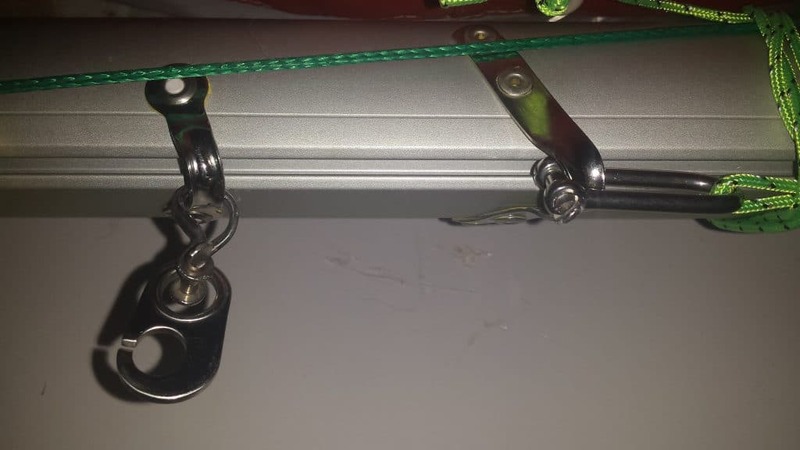 I retrofit with a high load ball bearing sheave for the spin halyard (yellow line) which runs out and forward through a block that connects to a line to keep tension on the ram (auto ram up) when the kite is up. 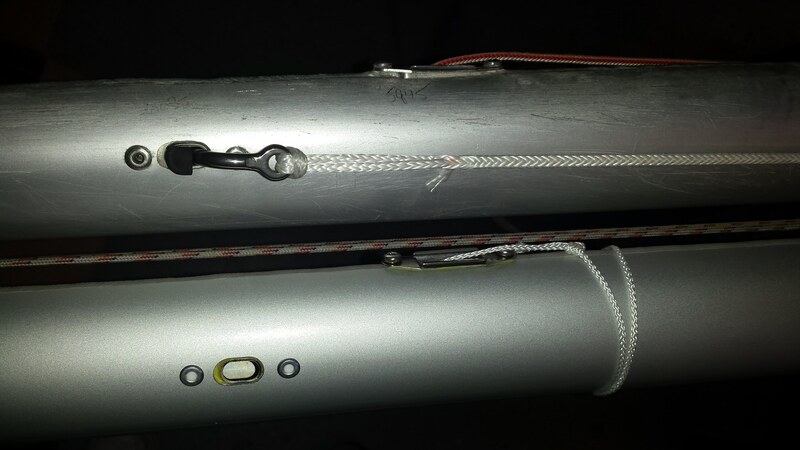 This keeps the mast from inverting under pole compression. I used 4 machine screw fasteners to secure the base to the extrusion. 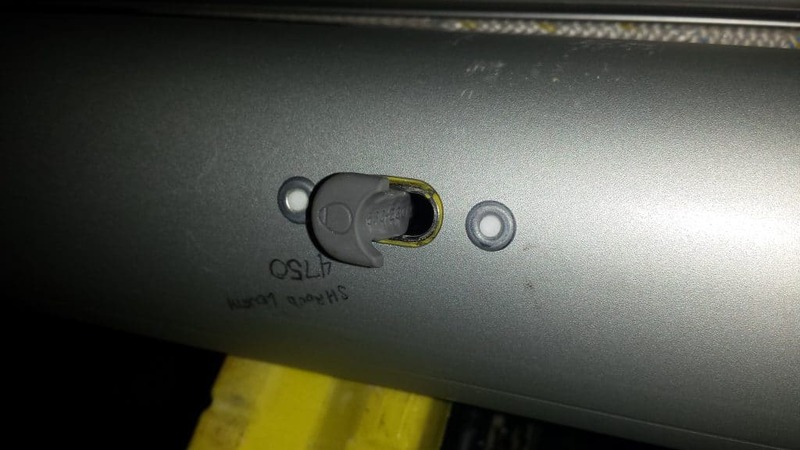 They are tapped into the aluminum and the plastic. I don’t want any relative movement here. 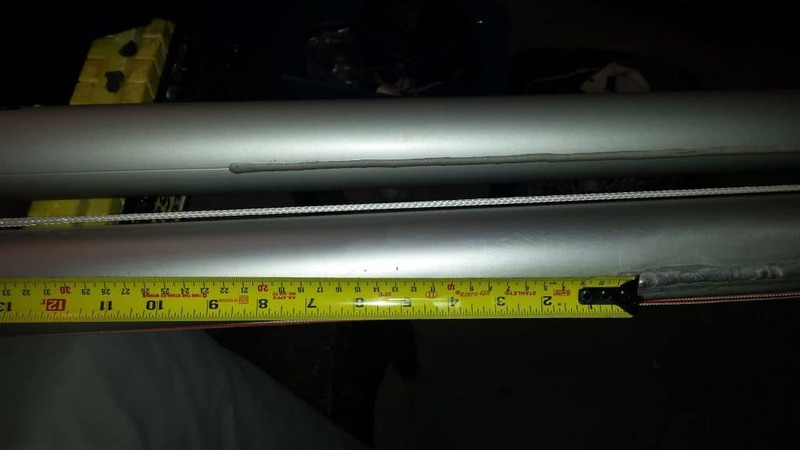 One other option that you will want to exercise is using the heavy-duty aluminum mast step and not the composite one, which can break (ask Mike Holt). If you have a late-model Rondar like mine (not the current gen but 2005-2014 about), the Alto with collar is too wide for the partner by a few mil. This is a bit of pain because the partner will need t be milled out properly and the inside reinforced with glass to account for the removal of fiber. Luckily, Macy Nelson had Peter Alarie create a special milling jig for this purpose so I plan to borrow his and do it right. I do think that the mast without collar will just fit the standard partner width. I don’t know about Waterat specs but you need at least 65 mm width to fit the Alto with the collar. The Selden Alto is a good mast option for the 505 and has already proven itself in competition. The manufacturing quality provides for outstanding fit and finish. The available hardware options are well-suited to our needs, look to be durable, and allow for ease of rigging. The service provided by Selden USA is also excellent, as is the quality of workmanship. Lower costs and better availability are benefits of the local distributor. For more information on the exceptional Selden dinghy mast range, see the following link to their product brochure.